This guide provides information about DePauw University's access to NYTimes.com, how to setup your account and what content is available to students, staff and faculty at DePauw. DePauw University Libraries are pleased to announce access to the New York Times daily newspaper on your computer, smartphone or tablet. (Note: this will not work on Kindle readers, only Kindle Fire.) Get the news each day along with other digital-only content via the web or the NYT app. All you need is your @depauw.edu email address to register. Step 2: Search for and select DePauw University. You will be redirected to the NYT registration page. * The confirmation email may be routed to your spam folder. You must click the link in this email to complete the registration. 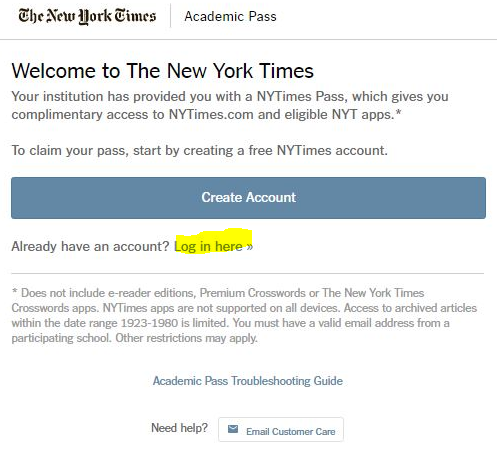 If you have previously registered your @depauw.edu email address on The New York Times site, you will click "Log in here" below the Create Account button link for Step 3. Anyone with a paid account using their depauw.edu address who wants to switch over, must first deactivate their subscription. That will "free up" the email address. Once your email address is available, you may follow the steps above, but instead of clicking "Create Account" click the link below ("Already have an account? Log in here") and login with your depauw.edu email address. If you run into other issues while trying to access the New York Times via the DePauw site license please visit the NYT Help page, email their support at: edu@nytimes.com, or call them at 800-753-7795. Premium crossword puzzle app (we know…boo! Academic Passes need to be renewed annually from the date of initial registration. 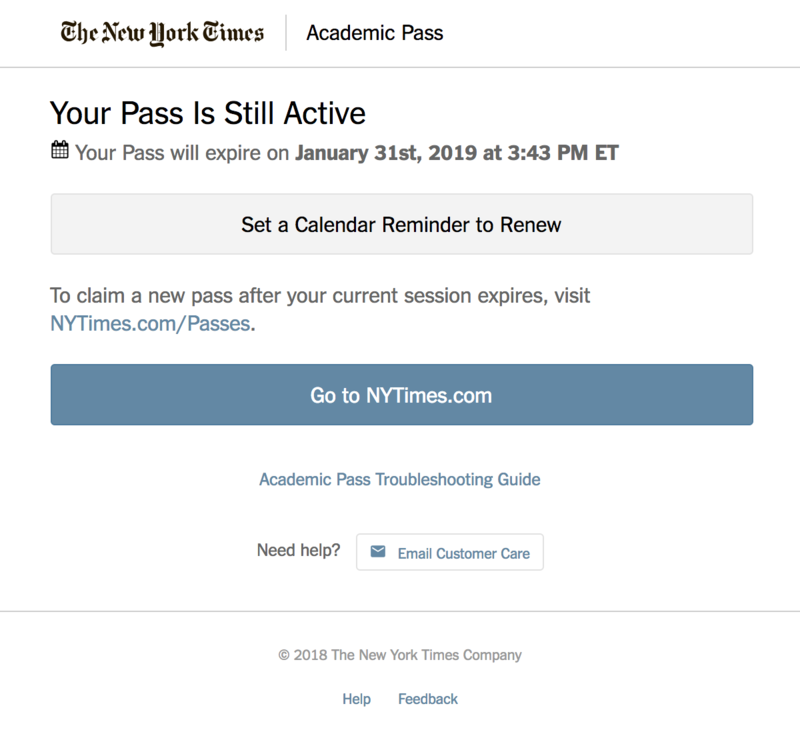 You will not be notified that your access has expired, but if you are seeing a message about hitting your limit of "free articles" while viewing the The New York Times online, it's probably time to renew. Visit NYTimes.com to renew your account. Log in with the DePauw email address and password you used during the initial registration. Follow the on screen instructions to complete the process. You can also check what date your account is set to expire by visiting NYTimes.com when logged into your account. It also provides an option to set a reminder to renew on your calendar.